Here are some fantastic free resources for spreading awareness of the ever-growing problem of elder abuse. This is not a comprehensive list, and we are always looking for innovative groups that have taken a stand against elder abuse. Please send your suggestions to centeronelderabuse@uci.edu. Visit www.AgelessAlliance.org for a 30-second, 60-second, or 3-minute Public Service Announcement about the magnitude of the problem and a grassroots social justice movement inviting people to join United Against Elder Abuse. To download the PSAs, please visit https://www.dropbox.com/sh/74k40kvfi276mdq/1P0QAs43h5. Click the video you want to download, then click the "..." in the bottom right hand corner of your screen. Click "Download" and choose a destination for the file. ONE in TEN Americans age 60+ experiences abuse each year, and many experience it in multiple forms. Nearly ONE in TWO people with dementia experiences some form of abuse by others. The New York State Elder Abuse Prevalence Study found that for every elder abuse case known to programs and agencies, 23.5 were unknown. In the same study, they examined different types of abuse and found for each case of financial exploitation that reached authorities, 44 cases went unreported. The National Elder Abuse Incidence Study estimated that only 1 in 14 cases of elder abuse ever comes to the attention of authorities. Elder abuse costs our nation billions of dollars each year. The annual financial loss by victims of elder financial exploitation were estimated to be $2.9 billion in 2009, a 12% increase from 2008. Older adults who experience elder mistreatment or self-neglect face a greater risk of being hospitalized than other seniors. Elders who had experienced psychological abuse, physical abuse, caregiver neglect and/or financial exploitation were twice as likely as non-abused elders to be hospitalized. Older adults who reportedly self-neglected were 1.5 times as likely to be hospitalized as other seniors. Survivors of elder mistreatment suffer significantly higher levels of psychological distress than nonvictims. Social support showed a beneficial effect on survivors' psychological distress. Elders who experience mistreatment and self-neglect face a greater risk of dying sooner. More than 41 million Americans are 65 or older, and elders comprise a growing proportion of the U.S. population. The Ageless Alliance Action Kit includes videos and documents to strengthen your stand against elder abuse. Please download and freely use these materials in your efforts to combat elder abuse. The World Elder Abuse Awareness Day Tool Kit contains resources to help you engage your community, educate others, raise awareness about this serious problem, and empower people to action to end elder abuse. The National Center for Victims of Crime offers artwork and other tools as part of the National Crime Victims’ Rights Week Resource Guide. Past years’ NCVRW materials can be found on the Office for Victims of Crime gallery. Look at materials from 2013, 2009, 2004, and 2003 in particular for images and campaign elements related to older adults. 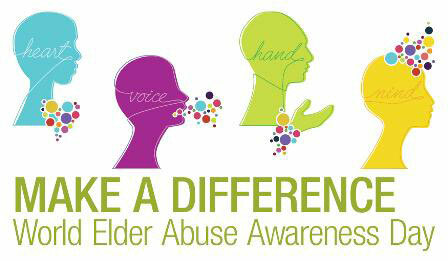 National Clearinghouse on Abuse in Later Life (NCALL) created posters, fact sheets, tips for service providers and other materials to honor World Elder Abuse Awareness Day. Community Elder Abuse Awareness Tool Kit, funded by the Department of Human Resources and Skills Development Canada (HRSDC) and the Teen Elder Abuse Awareness Kit funded by the Public Health Agency Canada (PHAC) released for WEAAD 2010 are available on the International Federation on Aging website. Federal Trade Commisson offers FREE PDFs and will mail bulk quantities of FTC education materials on topics including identity theft, telemarketing scams, work at home schemes, scams against immigrants, charities. Several of the publications are available in Chinese, Haitian Creole, Korean, Spanish, Tagalog, and Vietnamese.